Grease and line a loaf pan with parchment paper. Leave some of the parchment paper hanging over the edges, this will make it simple to remove the semifreddo once it's frozen. In a large bowl, add egg yolks, 2 teaspoons of vanilla extract, and 2 tablespoons of honey using an electric hand mixer, whisk until thick and creamy. Set aside. In another bowl, using an electric hand mixer whisk the egg whites and cream of tartar until soft peaks form. (about 3-5 minutes) Slowly add the 2 tablespoons of honey. Add ⅓ of the egg white mixture into the coconut cream, and fold until the mixture is combined. Add the remaining egg white mixture and fold in. Finish with folding in the egg yolk mixture. Be very careful when folding so the egg whites don't break. 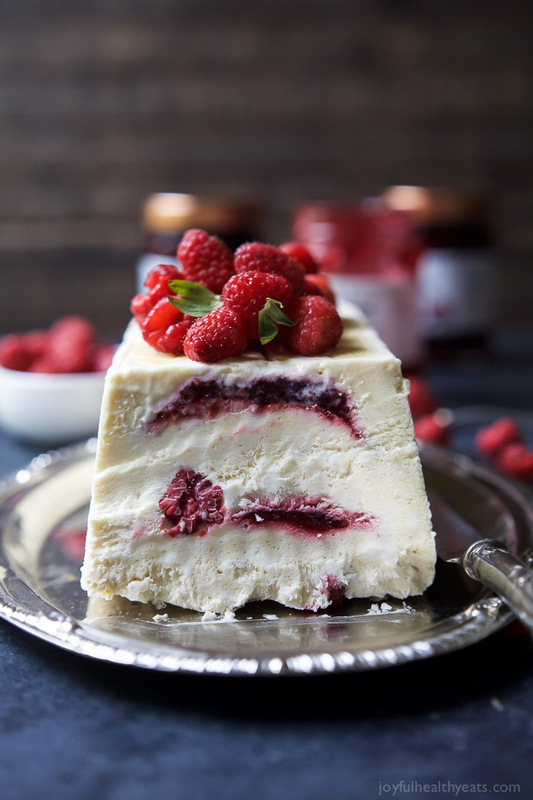 Pour ⅓ of the mixture into the prepared loaf pan, spread ¼ cup of Raspberry Amaretto Preserves out, add ⅓ mixture of coconut cream mixture, spread out the remaining Raspberry Amaretto Preserves, and finish with the remaining coconut cream mixture. Cover the loaf pan with plastic wrap and place in refrigerator overnight.